This week I’m going to be focusing on meals involving vegetables that grow locally during this season. This is my first year being a part of a CSA, so I’m learning a lot about what grows locally at various times of year and I’m being exposed to a lot of vegetables I don’t normally eat, like squash and turnips! Until a few weeks ago I’d never eaten a turnip in my life and the only squash I ate semi-regularly was pumpkin, which I’d only ever had in desserts. 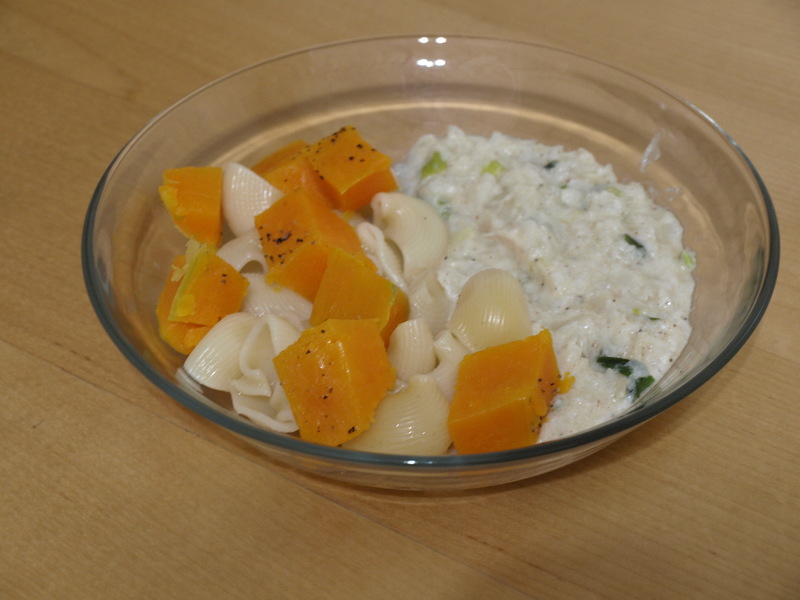 However, thanks to the recent delivery of a beautiful butternut squash and lots and lots of turnips, I was able to eat the following delicious meal! The mashed turnips make a great sauce, but can also be eaten as a side dish, while the squash is so tasty is can be eaten all on its own if you like or mashed and turned into a side as well. 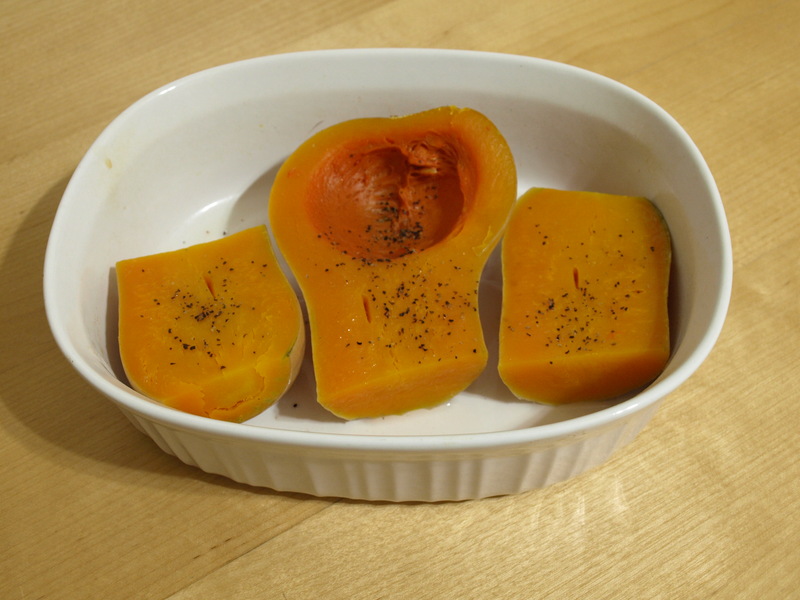 Clean your squash, cut it lengthwise and remove the seeds and fibers. Fill a shallow pan with a quarter inch of water. Place your squash in the pan (skin side down) and dot the flesh with margarine. Add salt and pepper to taste. Preheat oven to 400 F, cover squash and bake 35-40 min. Remove your turnip greens (if they’re still attached), clean the turnips, remove the ends and coarsely chop the turnips. Place them in a large pot of cold water. Boil for 15 minutes. You should be able to slice through a piece of turnip easily. Remove from heat, drain the water and mash with a potato masher. While turnips are cooking, dice the scallions and mince garlic, simmer in olive oil in a separate pan. Once turnips have been mashed add sour cream, Earth Balance, pepper, scallions, garlic and nutmeg. 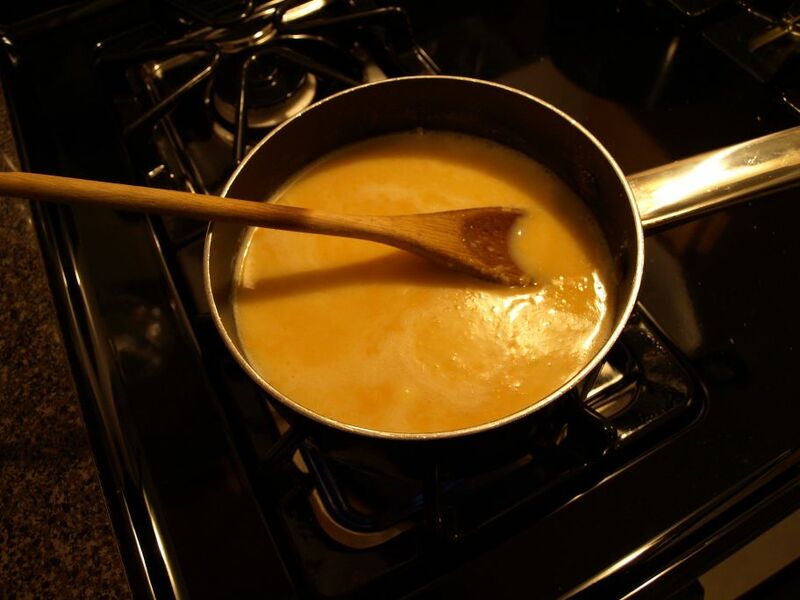 Simmer over low heat until margarine melts and everything is mixed together. Cook pasta, skin and cube squash and pour turnip sauce over everything or use as a side. My friend Mickey recently turned me on to Daiya vegan cheese. It doesn’t taste exactly like cheese but it comes pretty close and it melts really well. 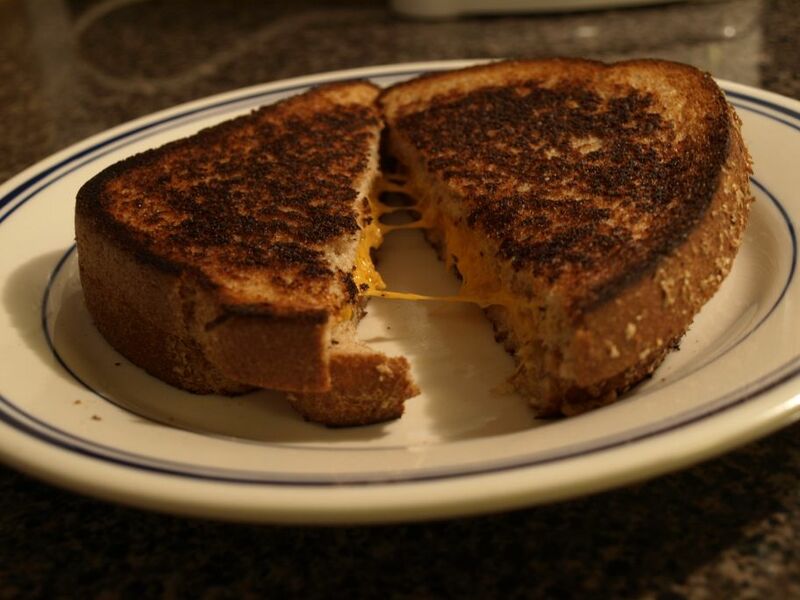 Check out the grilled cheese we made. So when he asked me if I wanted in on his next order I said, sure! 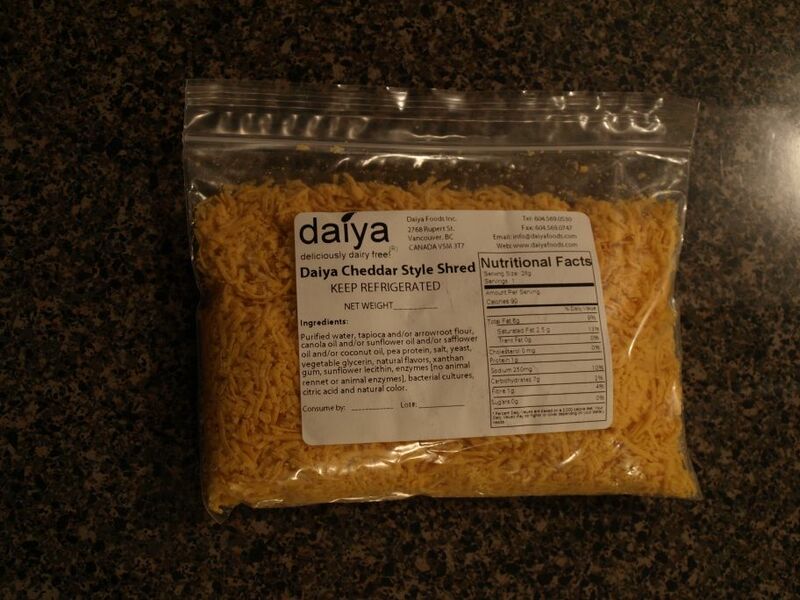 and I got a bag of the Cheddar Style Shred (28g/1 serving size) and I immediately began doing some experimenting. 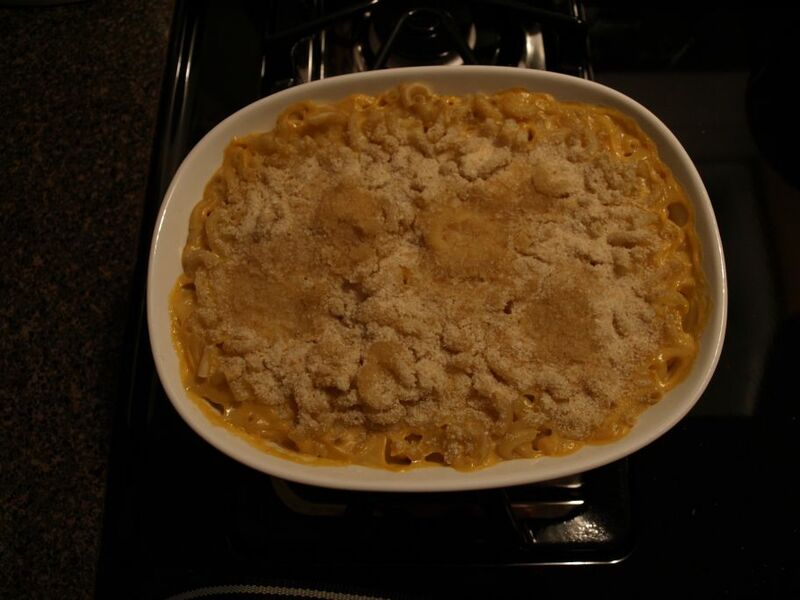 Mac & Cheese has been a favorite of mine since I was a kid and I have searched for the best vegan alternative for ages and I think I’ve found it! Preheat oven to 350. Cook pasta according to package directions. In a medium saucepan melt margarine and stir in flour. Gradually stir in rice milk. Cook, stirring constantly over medium heat until sauce thickens. Stir in salt and pepper. Add cheese and stir until cheese melts and there aren’t any clumps of anything left in the sauce. 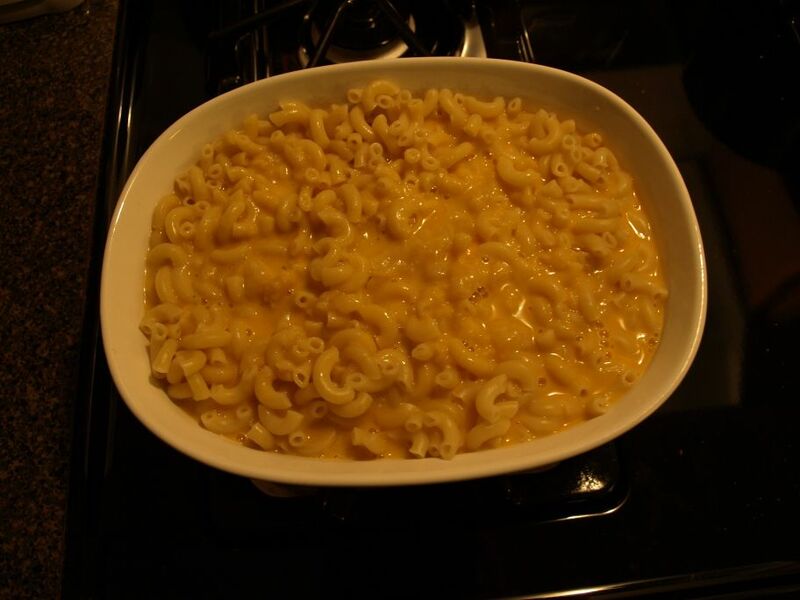 Drain pasta and pour 1/2 of it into a casserole dish, pour 1/2 of the cheese sauce over it. Pour second 1/2 of pasta in and add remaining cheese sauce. Top with bread crumbs to your tastes. (I usually brown my bread crumbs with a little margarine in a small sauce pan before spreading them over the top of the casserole). Bake 30 min.